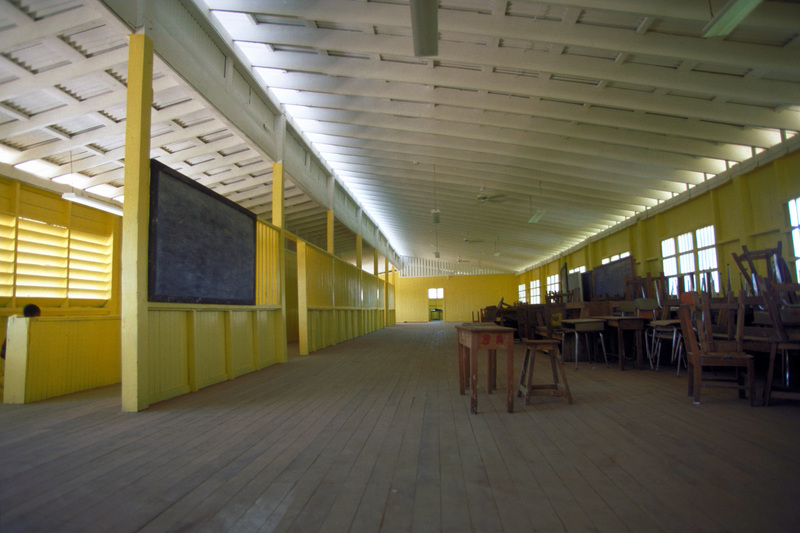 [Complete] Scene Caption: The interior classroom area of the Ascension High School, Georgetown, as seen following the completion of renovations which ended on 1 Sept. 1997. Engineers from the 820th Red Horse Squadron from Nellis Air Force Base, Nevada, 274th Marine Wing Support Squadron, Cherry Hill, N.C. and the 4th Engineer Battalion of the Guyana Defense Force, joined efforts to do repairs and clean-ups as part of this first combined humanitarian and civic assistance exercise conducted between the United States and Guyana. Military personnel from Air Force, Air Force Reserve & National Guard, Army, Army National Guard and Marine Corps participated in the exercise which included engineering and medical readiness training.